The second UFO is now a wearable garment. 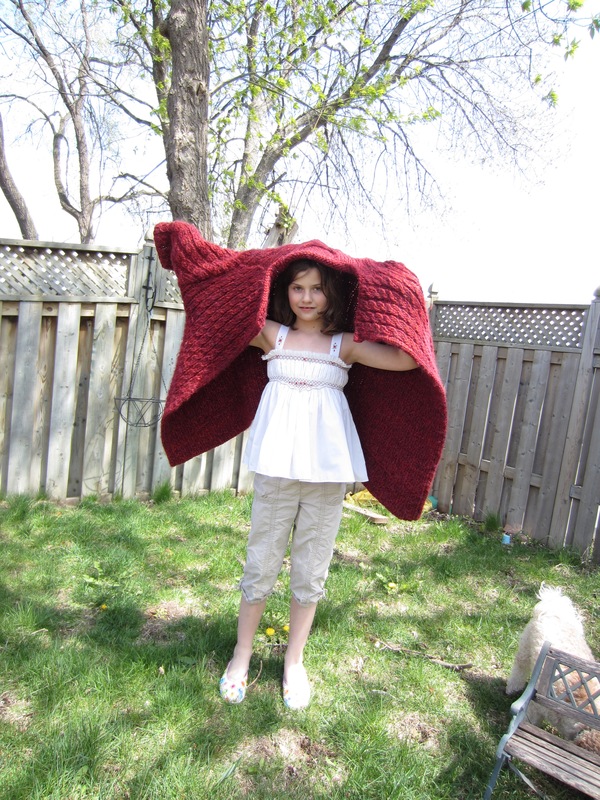 It’s about 9C outside – hence the big mommy-sized sweater! 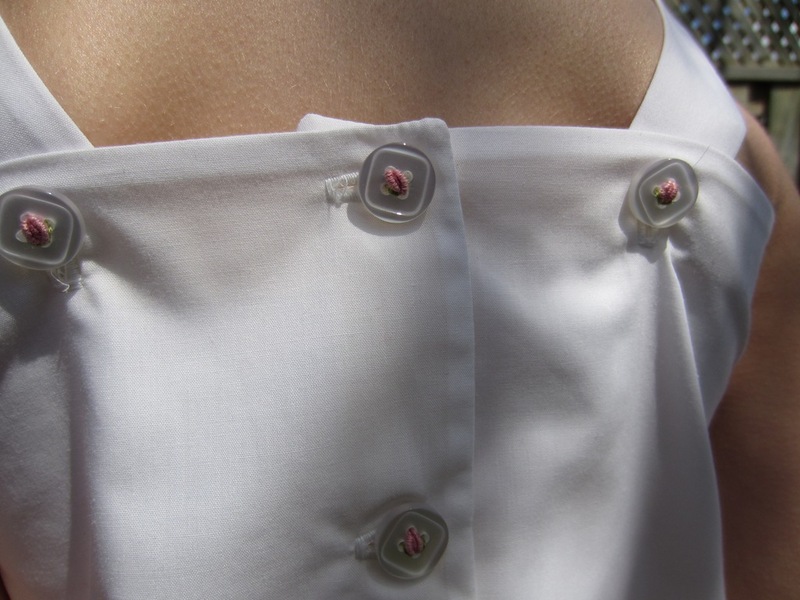 Rosebuds in the buttons for the fly-away back and adjustable straps. 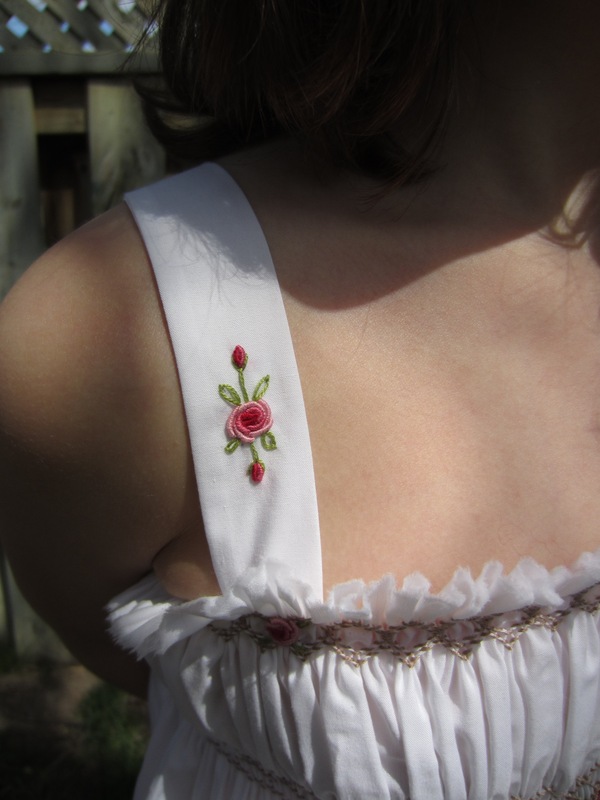 Front strap embroidery – bullion rose and rosebuds; detached chain leaves and fly-stitch stems & calyx. I also managed to quickly put together a new petticoat, since DD3’s outgrown the previous one. I used a RTW tank, cut it off at what I thought was waist length (it’s stretched a bit since it’s been hanging around waiting for a nice day for photographs) and attached a four-tiered peasant skirt. The bottom tier is about 6 yards in width. I used remnants from previous petticoats for this one, so the top two layers are different weights of Egyptian cotton shirting, and the two bottom layers are Swiss broderie anglais, which I originally purchased because of the fabulous edging for the last now-too-small petticoat. I finished the bottom with white satin ribbon. And the Lelli Kelly’s are too small this year – a big disappointment in this house! Oh these are so pretty! I love that embroidery where the top is gathered around the neckline (is that by machine?). No – all the embroidery and gathering is by hand. The pleats are made with a smocking pleater and the embroidery picks up and holds the pleats in place. It’s one of my favourite fun things to do! Beautiful button details and embroidery! I hope the weather warms up soon so she can start wearing this cute top! Very cute and thank goodness for mummy cardis on cold photo shoot days! I love the embroidery too. Both are gorgeous! And rosebuds to hold the buttons on- what a wonderful touch. Adorable top! I love the handwork. It’s cold here now, too. What’s up with that? So delicate and sweet- I love them! Both are lovely! Little girls do love swishy skirts. But oh, the top! Just divine. The details are all so sweet. This top is so sweet. I love all the details. You are such an artist!